Mark Jagasia has written a brilliant satire that rips through the hypocrisy of the tabloid media. 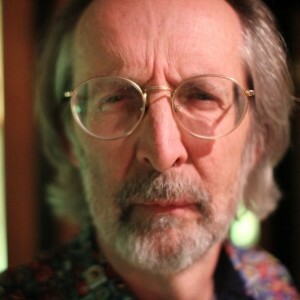 The monstrous editor of the Clarion, Morris Honeyspoon – played with demonic intensity by the wonderful Greg Hicks – fills his newspaper day after day with anti-immigrant tirades. Egged on by his absent foreign proprietor who never appears but whose wishes are conveyed by his oily and devout executive level messenger boy, Clive Pumfrey, he rails against the liberal establishment embodied by the BBC and the Sentinel – a well-known quality daily in thin disguise. At the news conference near the beginning of the play Morris seizes on a snippet of unconfirmed information and comes up with the headline “Fury over Sharia Law for Toddlers”, a fine joke which says all you need to know about his world view. He bends every rule to pursue his agenda and – as he sees it – to turn the tide of moral and political decay. The Clarion’s newsroom is populated by a varied bunch of dimwits, no-hopers, and lost-hopers. 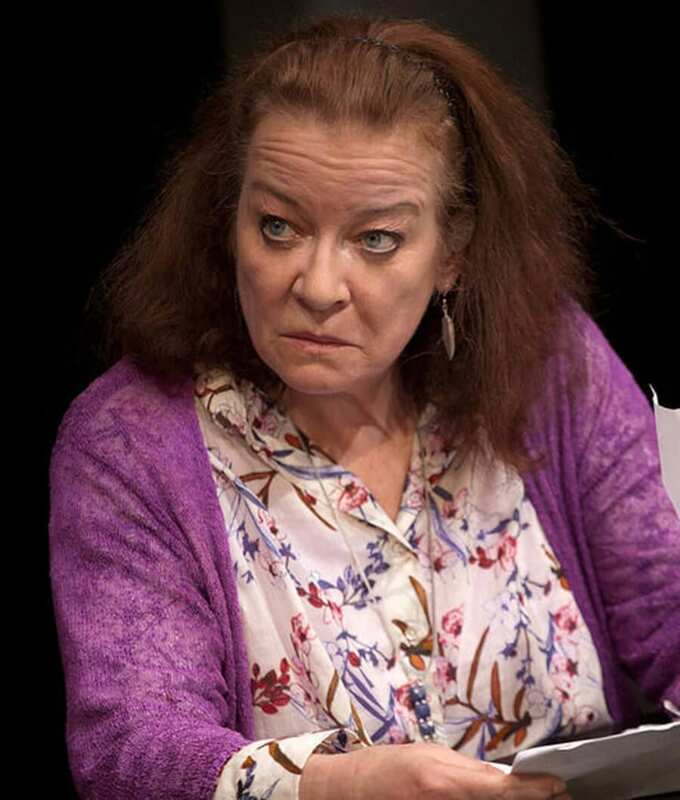 In a fine performance that injects a real note of pathos into the broad comedy, Clare Higgins plays Verity Stokes, a war correspondent with a heroic record of covering hotspots, reduced to ‘hackery’ at The Clarion by a drink problem and a dying husband. There is an incompetent news editor, an idealistic young reporter hoping that novel-writing will set him free from the Clarion’s clutches, and an ambitious young intern whose ignorance is only exceeded by her ambition – when she hears the list of war torn cities from which Verity has reported she entirely misses the point and remarks that she doesn’t want to work in the travel section. These three roles are played by Jim Bywater, Ryan Wichert, and Laura Smithers – all nailing the hopes and terrors that drive modern media in pitch perfect performances. It is generally held on the liberal left that the right wing press is such a joke that it is too easy a target for satire to mean much. What makes this play such a brilliant entertainment is that it gives all the best lines to Morris and his cronies. 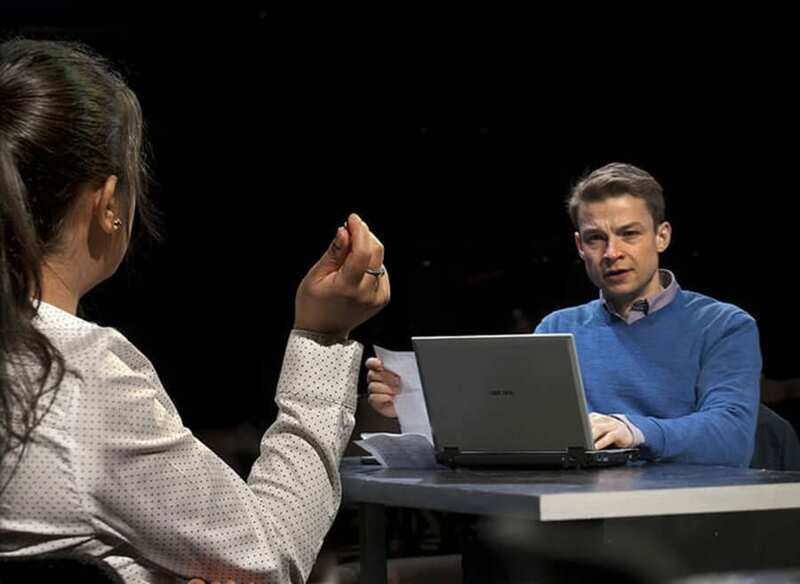 There is a superb rant that he delivers near the end of the play when he fears that a dark secret that has been leaked to The Sentinel and which could bring him down may be about to go public He lists the things he hates about modern ‘leftie’ Britain – “Brussels, the Human Rights Act, pamphlets translated into Urdu, bisexuals, Glastonbury, lattes, sun dried tomatoes” The way Greg Hicks says ‘Glas-ton-bury’ – each syllable separated and spat out with venom – is worth the ticket on its own. 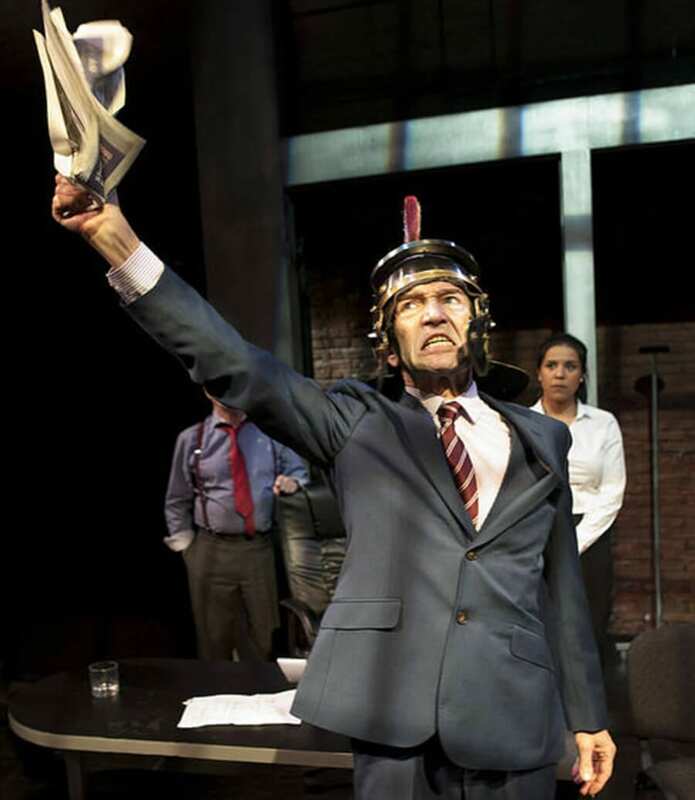 The play is directed by Mehmet Ergen, Arcola’s admirable artistic director and, despite the limitations of the small space and the crowded bench seating, the evening zips by. It is a brilliant show full of great one-liners and sharp observation. 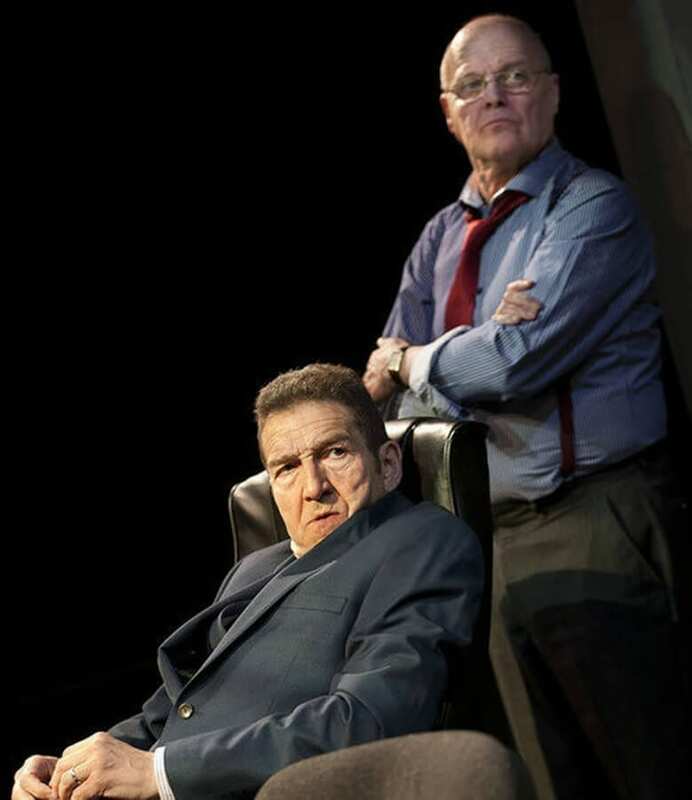 There is another play to be written – a tragedy perhaps – about the effect the attitudes peddled by Morris Honeyspoon and his ilk are having on “swarms” of vulnerable and terrified people. 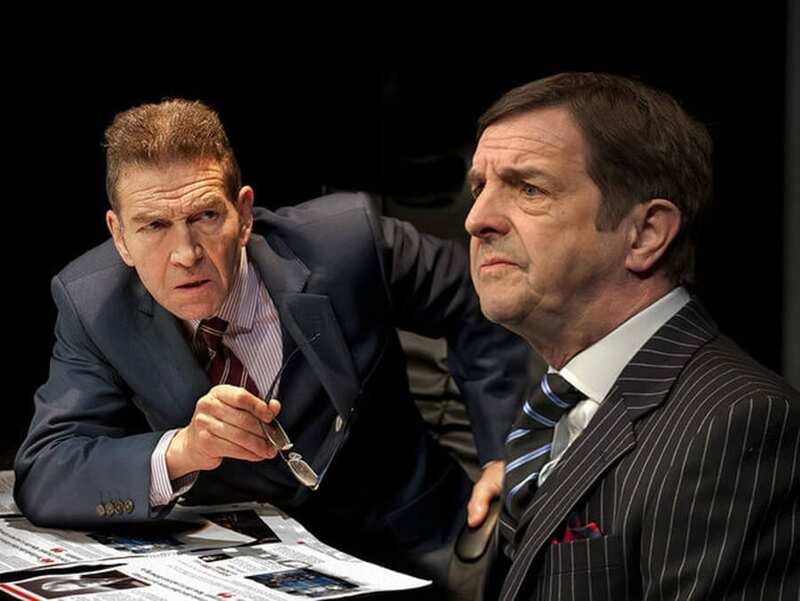 For the time being this play tells a part of the story with huge energy and wit.